Adrian Hart studied violin with Eta Cohen, Maureen Rivlin-Smith of the Royal College of Music London, and Eyal Kless of the Royal Irish Academy of Music Dublin. He is a graduate of the Purcell School of Music and the Royal Irish Academy of Music. In 2008 Adrian Hart graduated with first class honours at Trinity College Dublin with a Masters in Music and Media Technologies, studying composition with Donnacha Dennehy. As a violin and fiddle player Adrian Hart performs many styles of music, including traditional, contemporary, classical, commercial, electro-acoustic and improvised music. Adrian Hart recorded Bartok’s “Concerto for Orchestra” with the Purcell School of Music Orchestra in 1998, and in 2001 toured the USA with Irish pianist John O’Connor and the Royal Irish Academy of Music String Orchestra. In 2003 Adrian Hart made his solo debut in the National Concert Hall, Dublin, performing Bruch’s Violin Concerto in G minor with the Royal Irish Academy of Music Symphony Orchestra. 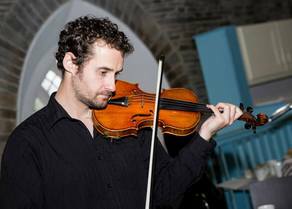 Since childhood, Adrian Hart has studied and performed Irish traditional fiddle music. Over the past decade he has extended his repertoire of traditional fiddle music to include other styles, in particular Klezmer, Balkan, Cajun, and Old-Time. Adrian Hart has composed, arranged and recorded many traditional tunes and tune-sets which have been broadcast and performed across Europe, the USA and Australia. Adrian Hart has performed extensively throughout Ireland, the United Kingdom, Europe and the USA, appearing on stage and recording with many leading artists. In October 2012 his piece “Tonnta’s Cuisle”, an electro-acoustic piece for string quartet bodhran and electronics was premiered in Istanbul by Hezarfen Ensemble. In 2013, Adrian Hart released his first solo album Cuisle on Diatribe Records. The album features original electro-acoustic compositions based on instrumental techniques found in traditional music repertoire.